When an eye is removed, the patient loses all vision and the cosmetic use of the globe. Noted complications include hemorrhage, infection and extrusion of the implant. Most patients with post-operative hemorrhage are either on blood thinners (e.g coumadin, plavix, heparin or aspirin) or are known to have a bleeding disorder. Such hemorrhages can be painful, but intervention is rarely helpful. Patients are typically treated with analgesic medications (pain-killers). Orbital Infections are very rare, but are more common with integrated orbital implants. 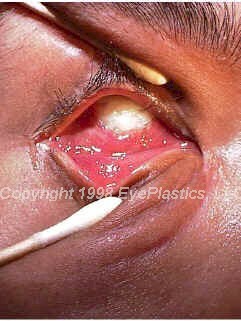 Most secondary orbital infections can be managed with antibiotics, covering or surgical removal of the orbital implant. Each orbit contains approximately 10 ml of fat; extraocular muscles account for 5 ml of volume and the normal eyeball accounts for approximately 7 ml. This involves enophthalmos, a deep upper eyelid sulcus, lower eyelid laxity with shallow fornix with possibly Ptosis or lid retraction. When an eye is removed, recall there is a 7 ml volume loss; however, the most commonly used 18 ml sphere replaces a volume of approximately 3 mm while a 16 mm sphere replaces a volume of 2 ml. A 20 mm sphere provides 4.1 ml of volume. The situation is made worse by orbital fat atrophy of up to 3 ml. It is unclear whether fat atrophy recurs as a lead to of reduction of blood supply or due to mechanical manipulation during surgical enucleation. 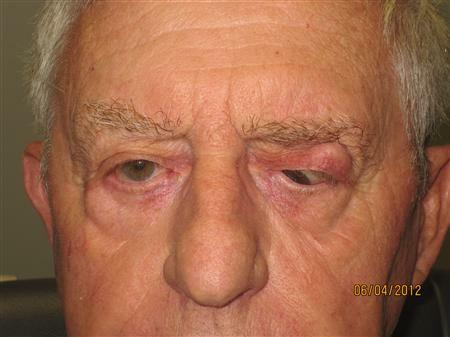 Bony orbital volumes are also noted to be smaller in patients who have had long-standing enophthalmia.